Apps are automatically updated on your (Kindle) Fire tablet, but Amazon periodically releases upgrades for the operating system itself ("Fire OS"). But you can manually check at any point for available software updates. 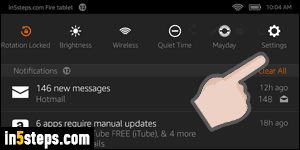 The main notifications screen will let you know when apps were updated (and which ones), and if some of them "require manual updates". In that case, tap on the notification and follow the installation prompt for the ones you want to update. From your Kindle Fire tablet, slide your finger down from the top of the screen, to show the settings panel: you'll see the same screen as the first screenshot. Tap on the Settings button on the right: select the Device Options menu. 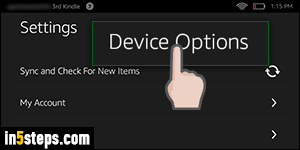 The Device Options screen controls settings that affect your tablet itself, as opposed to your Amazon account or online services. It's from there that you can show the percentage of battery life left, change the name of your device, check how much space left you have on your tablet, etc. In this case, just tap on the System Updates button, visible at the bottom of this screenshot. 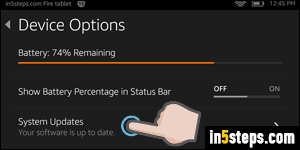 The next screen shows you which version of Fire OS you are running: Fire OS is the name Amazon gave to the heavily modified version of Android it is using for its Kindle Fire, Fire Phone, and Fire tablets line-up. 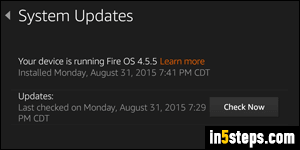 As of this writing (October 2015), the current version is Fire OS 4.5.5. 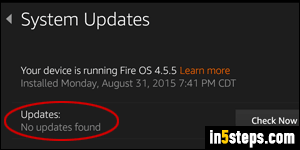 Notice that the next section shows you when your Kindle Fire tablet last checked for updates. To manually check for a new version of Amazon's mobile operating system, tap on the Check Now button: most often, you'll get the "No updates found" message shown on the screenshot. If a new software update is available, follow the prompts to install it. If it is a major version, it's always a good idea to backup all your data, photos, and documents before installing the update!